Get ready to grab some green. Our next incentive starts now and ends on St. Pats Day, 3/17/2018. It’s a drawing from our Facebook Group https://www.facebook.com/groups/Beths.Avon.Awesome.Customers/. 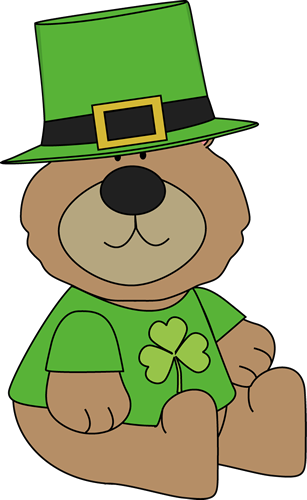 If you aren’t already a member – join quick to see if you have the Luck of the Irish. I need everyone who wants to enter to: First join if you haven’t already and then post the number 1, 2 or 3. There are 3 envelopes and the one you pick contains the dollar amount of the Avon bundle you win. 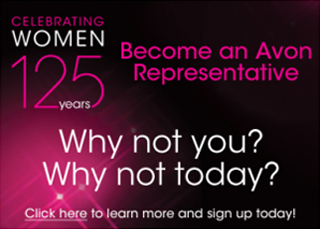 Prizes range from $25 to $150 worth of Avon. Let’s your friends in on the fun too. Tell them about the fun Avon lady. One lucky person will be selected on St. Pats Day and will win the bundle corresponding to the envelope you chose. This promotion is in no way sponsored, endorsed or administered by, or associated with Facebook. By entering, entrants agree to complete release of Facebook. Currently up is Avon Makeup Campaign 7 Brochure. Just a few days left for this brochure. There are some great sales, so check them out! 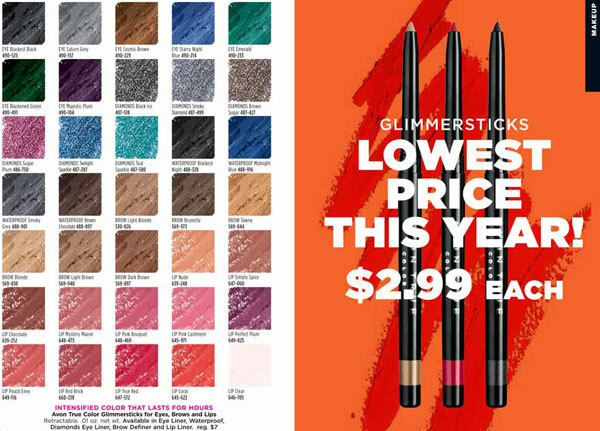 Beth’s picks for Campaign 7 – Glimmersticks. Glimmersticks have been one of my faves as well as the majority of my customers for years. They are retractable, so there’s no need for sharpening. They come in eye, lip and brow colors (some available in waterproof). Colors are really pretty and they last. Regularly $7, right now On Sale for $2.99 each. Go ahead and pick some Spring colors – you know you want to! Avon True Color Moisturizing Eye Makeup Remover Lotion works quickly and easily to gently remove all traces of eye makeup. Plus, it conditions and moisturizes your lashes and the fragile skin around your eyes. AVON TRUE COLOR means the color you buy is the color you apply. Now all your favorite lipsticks, glosses, eye shadows and nail enamel have Avon’s acclaimed TRUE COLOR technology, designed to give you the natural flawless look you want… nothing less. Rich pigments are blended into our high-quality formulas for guaranteed color that stays true all day. It’s been some time now since I was able to wear heels. I have problems with my back and therefore need some support in my shoes, And they must be flats. These are my favorites for Spring. Cushion Walk© Multi-Print Kicks Tennis Shoes with spring colors and my butterflies. These are wipe cleans. 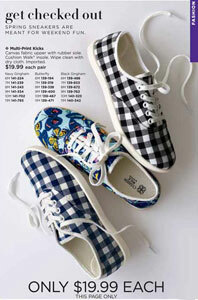 For some weekend fun, pick the butterflies with me or the gingham in black or navy. On $19.99 per pair. Stay tuned, next Campaign some great deals on foundation. Many of us need to change up to a slightly darker foundation for spring and summer. Get ready to stock up. 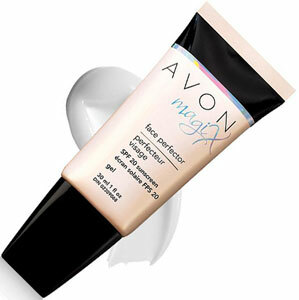 PR Buzz – As mentioned in a recent Marie Claire magazine – Avon Magix Face Perfector is named a HOT must have . Great as a primer and makes a great light foundation alone. Upgraded formula! Is it makeup? No, it’s MagiX! Avon’s exclusive HD Finish Complex provides the “magic” in this colorless skin-perfector. A revolutionary colorless gel-to-powder formula provides invisible coverage for a naturally flawless finish and keeps skin looking naturally matte for 7 full hours. The “magic” behind magiX is Avon’s patent-pending High Definition Finish Complex, an exclusive complex that works to counteract shine and visibly smooth the look of fine lines and pores! The Face Perfector can be used as a primer, but also can be used on its own to blur away imperfections. The colorless primer is perfect for all day wear and fights the look of oily shine. It also has SPF 20 to help keep your skin healthy and glowing.